The knowledge we have today about reproduction in mammals is well advanced, the morphological aspects, endocrine, biochemical, molecular as well as regulatory mechanisms and signal transduction related to reproduction, can be manipulated to support assisted animal reproduction. Thus, the scientists focusing on the biology of reproduction have been able to clone and freeze gametes in germ cell transplantation, with worth-mentioning advances in basic research. A review of books on reproduction in mammals, do not provide extensive information; however, books published on reproduction in bats have opened to us the fascinating world of reproduction, which delineates some of the paradigms established for the generality of mammals. Books on reproduction in bats, contain information covering aspects of reproductive ecophysiology, morphology and little about reproductive physiology, but none is focused on the physiological and biochemical aspects of reproduction in bats, as they were published at a time when information about these species was not enough to explain these processes. However, recently, many articles have been published that intend to explain the extraordinary physiology and biochemistry of reproductive processes in bats. 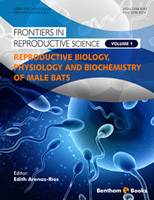 Although the literature on reproduction in bats is limited as compared to reproduction in mammals, this book only contains seven chapters on advances in biology, physiology and biochemistry of reproduction in male bats and its sperm cells.